SQL Server Developer Edition is a version of SQL Server with some restrictions on functionality, and is designed for development and testing purposes. It is ideal for those developers who want to get a taste of the Enterprise Edition before purchasing the full product. The description following applies to the full product. 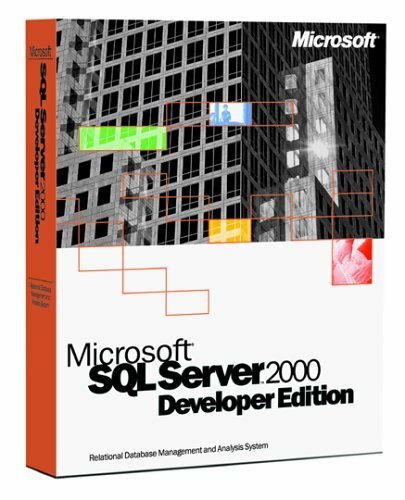 SQL Server 2000 is a fully Web-enabled database product, providing core support for XML and the ability to query across the Internet and beyond the firewall. Its features include a data-mining feature called Analysis Services, which lets anyone with SQL and Microsoft Visual Basic programming experience use OLAP tools to create custom analysis applications. Using a middle-tier server, SQL Server 2000 can perform complex analyses on large volumes of data with exceptional data-retrieval performance. Two new features, linked OLAP cubes and HTTP access to cubes, offer powerful data analysis over the Web. In addition to enabling you to extend your analysis capabilities to partners outside the firewall, these features deliver new value by creating opportunities to sell access to your database to new customers over the Web. SQL Server 2000 extends your e-commerce functionality through rich support for XML, easy Web access to database information, and powerful analysis tools, coupled with high availability and tight security. This means that Web developers can access data using XML without having to do complex programming, and database administrators can manipulate data easily in XML format using Transaction SQL (T-SQL) and stored procedures. Secure HTTP database connectivity ensures that data can be queried--even by relatively inexperienced users--through a URL and intuitive user interfaces. SQL Server 2000 also makes querying from the Web relatively easy. The enhanced English Query tool allows developers to build natural, English-language interfaces to SQL Server in Microsoft Visual Studio. In addition, English Query can now generate Multidimensional Extensions (MDX) to query against OLAP cubes. "SQL Server Developer Edition is a version of SQL Server with some restrictions on functionality, and is designed for development and testing purposes." That is partly correct: In fact, Developer Edition is designed for development and testing purposes. That's why there's NO restriction on functionality. Only restriction is on LICENSE. This Devloper edition is running great on my Windows XP machine with SP2. I have no problems at all with it. It is feature rich and is restircted to a testing enviroment as opposed to a produciton enviroment. Well worth the money! If you need free, Microsoft has other SQL alternatives such as MSDE SQL desktop engine and a downloadble fully functional SQL Express 2005 verison of CTP (community Technology Preview) So many reasons to convert from Sybase there is not room here to list them.